Who doesn't want more storage space in their home? Our striking range of solid oak storage cabinets provides a stunning durable solution, bursting with style. Who isn't looking to add more storage space to their home? 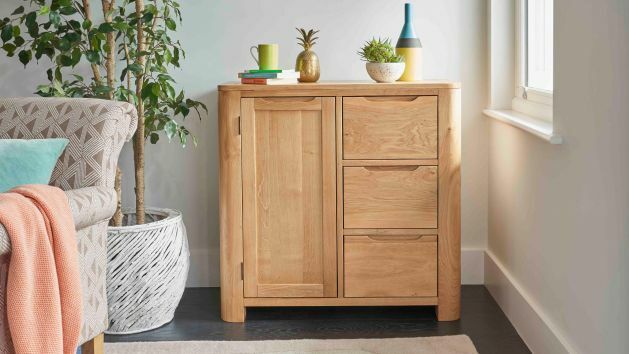 We've designed a striking range of solid oak storage cabinets to make sure your living room, home office, dining room, and more is packed with both style and storage, using only the highest quality materials. Our cabinets come in a range of styles and finishes to suit any home. From the contemporary clean lines of our Alto range, to the traditional country style of French Farmhouse, there is bound to be the perfect storage unit for you. Choose from pieces with our remarkable rustic and natural wax finishes; the rustic wax lends gorgeous deep honey tones to the wood, while the clear natural finish allows the bright wood grain patterns to shine through. These cabinets have a great blend of spacious cupboard and drawer space, and as always, each of our drawers is finished with real dovetail joints for durability. Browse all our solid oak storage cabinets today!